By Vedic gods we mean those divinities (devas) who are mentioned in the four Vedas. Information about the gods and goddesses worshipped by the Vedic people comes to us mainly from the Vedas themselves. The Vedic people worshipped several gods. They propitiated them for various purposes during sacrificial rituals, practice of austerities and meditation. The methods of worship and making ritual offerings are also laid out in the Vedas. Of the four parts of the Vedas, the first part called the Samhitas contain invocations or prayers to various gods and goddesses. The second part called Brahmanas contain the methods and procedures to be followed while making such offerings. The third part called Aranyakas contain information about more complex sacrifices that were not usually performed or well known to the public. The fourth part called the Upanishad contain the secret knowledge of internal rituals for achieving liberation. They provide information about the hidden aspects of the deities and their symbolic significance in the human body. According to the Vedas, Brahman manifested a part of Himself during creation and diversified Himself into Isvara, Hiranyagarbha and Viraj. He created the earth, the mid-region, the heaven. He created gods and celestial beings, demons and humans/ God and celestial beings reside in the heaven and the mid-regions respectively. Humans and other mortal beings inhabit the earth or our world. The demons reside in the nether regions below the earth. In the mortal world, He manifested as Death (or Kala) and became its ruler. He created hunger and thirst and subjected the beings, including the gods in the heaven to the same. To satisfy them He created food of several kinds. The gods have immense powers, but they do not have the ability to make food for themselves. Human beings have the ability to make food for themselves and others, but do not have the supernatural powers of the gods. Brahman created this distinction to ensure that both gods and humans live in harmony, depending upon each others, and participate in creation by doing their dutiful duties. Thus it is the duty (dharma) of gods to help humans and it is the duty (dharma) of humans to live helplessly and help gods and other beings with nourishment by performing sacrifices. The Vedas declare that the human body is similar to the body of the Cosmic Self, Purusha, who manifested in creation as the Lord of the Universe. Just as there are four tiers in the universe, there are four planes in a human body. The head represents the sky or the heaven. The trunk including the chest and the stomach represents the mid-region, where breath flows and the heart beats. The hips and the legs represent the mortal world. Just as the gods reside in the macrocosm, they reside in our bodies also in their respective sphere as various organs, namely the organs of action (karmendriyas) such as the five organs of speech, such as hands, feet etc., the organs of perception such as the eye, the ears, the nose, the tongue etc., and the internal organs, namely the mind, the ego and the intelligence. Just as they depend upon our sacrificial offerings in the external world for their nourishment, they depend upon us internally for nourishment through the food we eat. While in the external world, the gods receive their share of offerings from fire who is the first recipient of the offerings in the sacrifices since we pour them into fire only, in the body also the gods receive their offering from the digestive fire which resides in the digestive tract. From there the food is supplied to various divinities through the five breathing channels called Prana, Apana, Samana, Vyana and Udana. The Upanishads affirm that just as Vayu rules the mid-region and pervades the earth and the heaven, Prana pervades the whole body and acts as the overlord of the organs. The Vedic sacrifices are essentially meant to achieve the four aims of human life, namely fulfillment of obligatory duties (dharma), wealth (artha), pleasure (kama) and liberation (moksha). Duty was the foundation and liberation was the ultimate aims. The Vedas affirm clearly that those who perform sacrifices for material ends or the first three aims would be reborn again while those who achieve liberation by living selflessly, fulfilling their obligations would never return. Through the sacrifices and invocations the worshippers of the Vedic gods seek, wealth, peace, happiness, progeny, fame and name, power over the natural forces, destruction of enemies, longevity or a full lifespan, good health, protection from misfortune, sickness and loss of cattle. The Vedic hymns allude to several gods. Based upon the number of invocations addressed to each, we may identify the principal ones. However, their actual number may far exceed our current estimates, since the current version of the Vedas seem to be a remnant of the original texts that existed in the early Vedic period. The Vedas also allude to the existence of ancient gods who reside in the highest heaven and participate in the universal sacrifice performed by Brahman. In the Brihadaranyaka Upanishad, when Vidadgha Sakalya asked Yajnavalkya, how many gods were there, he began the answer saying, "As many as mentioned in the offerings made to the gods of the universe, namely three hundred and three, three thousand and three." On beings queried further, he reduced the number gradually from three thousand three to thirty three, then to six, then to three, then to two, then to one and half and finally to one. In the same conversation, he identified 33 gods as the important ones, namely eight Vasus, eleven Rudras, twelve Adityas, Indra and Prajapathi Brahma. These gods belong to different sphere in creation. Based upon the number of invocations available in the Vedas, the following Vedic gods and goddesses are important: Indra, Varuna, Agni, Rudra, Mitra, Vayu, Surya, Vishnu, Savitr, Pusan, Usha, Soma, Asvins, Maruts, Visvadevas, Vasus, Adityas, Vashista, Brihaspathi, Bhaga, Rta, Rhibhus, Heaven, Earth, Kapinjala, Dadhikravan, Rati, Yama, Manyu, Purusha, Prajanya Sarasvathi. Aditi is another prominent goddess. She is considered the mother of gods. Although there are no hymns directly addressed to her, she is mentioned in several of them. Indra is the lord of the heavens. He is the most popular and powerful of the Vedic deities. He is described as the god of the blue sky. He rides a white elephant called Airavata and wields the dazzling weapon of lightening called Vajrayudh made by another god Tvastur. He fought many battles to drive the demons away and ensure victory to the gods. He also destroyed many cities of his enemies. His most famous achievement was slaying of Vratasura. He killed the demon of the dark skies (symbolically the clouds) with his weapon (the lightning) and released the cows (waters) that were held in captivity by him. Prone to drinking soma, often losing control over himself, mighty and sensuous, always concerned about his survival and status as the leader, at times scheming and at times troubled, Indra is more like a king upon the earth than of heavens. He has a spiritual side too. According to the Kena Upanishad, he is the only god to have gone nearest to Brahman and was to know Him as Brahman. This act of him earned him the right to become the ruler of heavens. In the Chandogya Upanishad we are told that he studied under Prajapathi Brahma and learned the secrets of immortality. 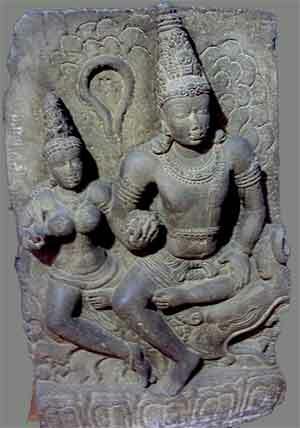 in the images, Indra is generally shown with four arms and as riding on a while elephant. Sometimes he is shown with his wife, Sachidevi, but mostly alone. 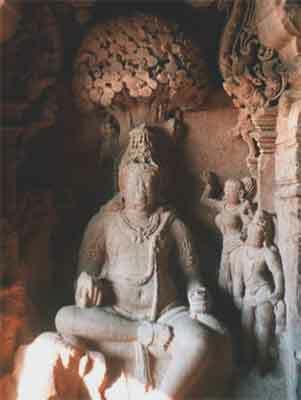 With the emergence of Saivism and Bhagavatism in the post Vedic period, the importance of Indra gradually declined. If we find in Indra the qualities of a war lord or a typical king, in Varuna we see the earliest signs of an omniscient, omnipresent, omnipotent and compassionate God, the precursor the Upanishadic Brahman. Varuna is the ruler of the worlds, the ordainer and enforcer of law and upholder of the world order. In one of the Rigvedic hymns he is described as the Lord of the earth and heaven who sustains the tree that has its roots in heaven and braches down below. This description reminds us of the famous Asvattha tree of the latter day scriptures. And how does he know all this? With innumerable spies (rays of light) who are spread every where acting as his eyes and ears, he knows all that goes on in this world. If two people talking together, beware that Varuna is there watching every thing that is going on. Born to Aditi, and friend and brother of Mitra, Varuna is the protector, "the Holy One, helper of all mankind, the law maker whose holy laws remain unweakened." Together with Mitra, he controls the world order, Rta and when people transgress the moral order and commit sin, he knows and punishes them. But if they repent and seek forgiveness, he forgives them too. He causes the rains to come down and the sun to travel. He makes the rivers flow. The rivers that flows because of him know no weariness, nor they cease flowing. Many invocations of Varuna repeatedly beseech him to forgive sins, like this one," If we have sinned against the man who loves us, have ever wronged a brother, friend, or comrade, the neighbor ever with us, or a stranger, O Varuna, remove from us the trespass. If we, as gamesters cheat at play, have cheated, done wrong unwittingly or sinned of purpose, cast all these sins away like loosened fetters, and, Varuna let us be thine own beloved." 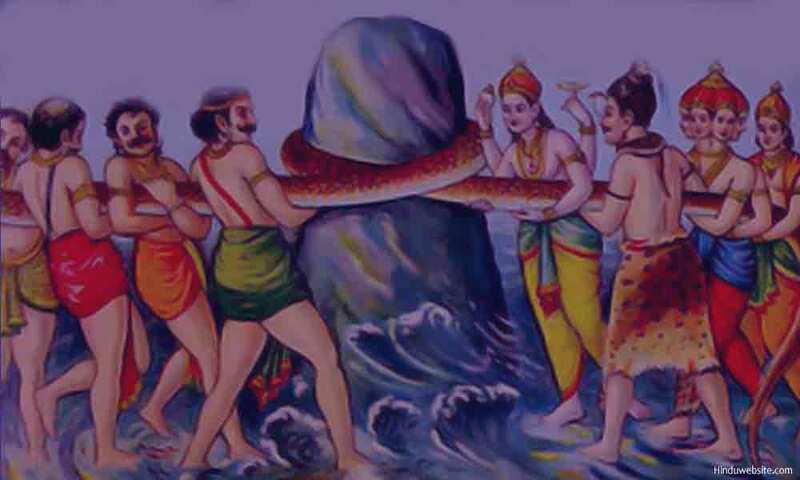 Varuna lost much of his importance as an omnipotent and omnipresent god after Indra assumed more prominence. He was subsequently relegated, or rather demoted to the position of a dikpala or ruler of a quarter (the western hemisphere) and lord of the oceans and water. In the iconography he is depicted as the rider of a chariot drawn by seven swans, with four hands and an umbrella over his head. In some images the swans are replace by a crocodile, suggestive of his lordship over the aquatic life. Agni is the chosen Priest, God, minister of sacrifice, the hotar, who lavishes wealth and dispels the darkness. Sapient-minded priest, truthful, most gloriously great, ruler of sacrifices, guard of Law eternal, radiant One, no sacrifice is complete without his presence. His presence verily ensures the success of a sacrifice, because whatever sacrifice he accepts goes to the gods. Agni is the messenger, the herald, master of all wealth, oblation-bearer, much beloved, who brings the willing Gods from the heavens and makes them sit on the grass with him near the sacrificial altar. He is appointed by Manu as the priest. He is often invoked along with Indra, with whom he shares the passion for soma drink. He is also invoked along with Maruts probably to ward off the dangers of forest fires. Agni, was the earliest Angiras, a Seer. After his holy ordinance the Maruts, were born with their glittering spears. Addressed as immortal Jatavedas, many-hued effulgent gift of Dawn, bearer of offerings and the charioteer of sacrifice, Agni is the Lord of Red Steeds, who loves songs. Kind and bountiful giver of gifts, of wondrous fame, Agni is the friend of all, loved by many in their homes. The Vedic Aryans were well aware of his destructive ability, as he sets the forests aflame. "Urged by the wind he spreads through dry wood as he lists, armed with his tongues for sickles, with a mighty roar. Black is thy path, Agni, changeless, with glittering waves! when like a bull thou rushes eager to the trees, with teeth of flame, wind-driven, through the wood he speeds, triumphant like a bull among the herd of cows, with bright strength roaming to the everlasting air: things fixed, things moving quake before him as he flies." We also know some thing about his origins. Matariswan brought him down from the heavens and handed him over to the Bhrigus for keeping. In some of the hymns like the following ones, we see Agni being elevated to the status of a supreme god, " Agni is the Vaivashnara the center of all people ... He is in the sky as well as at the center of the earth." A similar notion can be found in this hymns also. "Commingling, restless, he ascends the sky, unveiling nights and all that stands or moves, as he the sole God is preeminent in greatness among all these other Gods." In the images, Agni is depicted with two heads, long flowing hair, a pot belly, six eyes, seven hands, four horns and three legs. His seven hands represent the seven flames and the three legs represent the three worlds which he reigns. His pot belly denotes his love for rich oily food. 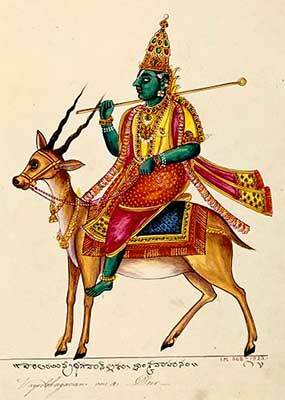 His consorts are svaha and svadha. Being a dhoomaketu, smoke is his banner. The Ram is his vehicle, and the ram being a typical sacrificial animal, his association with it denotes his connection with sacrificial rituals. The Rudra of the Rigveda is a militant god of storms and lightening and a "provider of medicines". Though he did not enjoy the same status as Indra, Rudra definitely enjoyed his own importance in the Vedic pantheon because of his tempestuous nature, his association with storms and storm gods called Maruts and his ability to bring medicines to the people to prolong their lives. He is a fierce looking god, well built and golden in color, with braided hair, "of firm limbs, multiform, strong, tawny, who adorns himself with bright gold decorations. The strength of Godhead never departs from Rudra." Father of Maruts, the Rigvedic hymns describe him eloquently, "Of your pure medicines ... those that are most wholesome and health bestowing, those which our father Manu hath selected, I crave from. Rudra for our gain and welfare." He wields the thunder bolt, bow and arrow, and sends down streaks of lightening shaking the worlds, making people nervous with fear and trepidation and disturbing the cattle in the cow pens. Intelligent, and benevolent, he protects people from their enemies. We do not know whether the Rigvedic Rudra was a precursor to the Rudra of later times. But the resemblance in some fundamental traits between the two and the appeal to both in prayers and supplications not to harm the cattle and the people with their anger, is too evident to be ignored. The following hymn is one such example, which in many ways sounds like a verse from the Svetavatara Upanishad, "O Rudra, harm not either great or small of us, harm not the growing boy, harm not the full-grown man. Slay not a sire among us, slay no mother here, and to our own dear bodies, Rudra, do not harm. Harm us not, Rudra, in our seed and progeny, harm us not in the living, nor in cows or steeds, Slay not our heroes in the fury of thy wrath. Bringing oblations evermore we call to thee. Even as a herdsman I have brought thee hymns of praise: O Father of the Maruts, give us happiness, Blessed is thy most favoring benevolence, so, verily, do we desire thy saving help." Some times the hymns refer to not just one Rudra but a group of Rudras eleven in number. According to some this is a symbolic reference to the ten vital breaths and the mind or suggestive of his association with the Maruts. Mitra and Varuna are both lords of the heaven. Together they uphold the law, cause the cows to stream, the plants to flourish, and, "scattering swift drops, send down the rain-flood". Both are Adityas and mostly are invoked together probably because of their close friendship. The watchful twain, most potent, together uphold Rta or the moral order. "Firmly set in heaven is Mitra's home, and Aryaman's and Varuna's. Thence they give forth great vital strength which merits praise, high power of life that men shall praise." We are informed from the hymns that Mitra stirs men to action and sustains both earth and heaven. Both Mitra and Varuna are guardians of the world, who sit in a gold hued chariot from day break and behold the infinity. In course of time, Mitra came to be associated with morning light, while Varuna with night sky. Vayu is a described in the Rigveda as a beautiful god, ideally the first partaker of soma juice which he seems to be especially fond of. He is a friend of Indra and a hero who shares the glory of victory with the latter. He is swift as mind, the thousand-eyed and the Lords of thought. He drives a chariot yoked with steeds, whose color vary from from red to purple and the number from two to hundreds and even thousands, depending upon the occasion. He is praised in the hymns as the Intelligence, who illumines the earth and heaven and makes the Dawn to shine. For him the dawn spreads her radiant garments in the dark and distant skies. Invisible, he moves in the heavens as well as in the human body as the vital breath, like Rudra, Vayu also brings medicines to cure people. For his sake the cows yield milk, and to him the coward prays for luck. He is a protector of people whom he protects from every world and from the highest world of Gods (their wrath). In the post Vedic period, Vayu became the lord of the north western quarters and father of Hanuman and Bhima, symbols of immense strength, loyalty and brotherhood, which were the original qualities of Vayu as a trusted friend of Indra and protector of people. Blue in color, he is depicted with four hands. 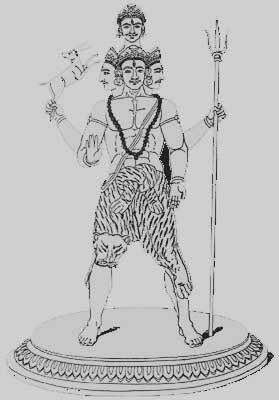 He holds a fan and a flag in two hands while the other two are held in abhaya and varada mudras (postures). Surya is the blazing sun. He is one of the Adityas, god among gods, the light that is most excellent, golden colored, who rides the skies in his golden chariot, drawn by seven bay horses, who are described in the hymns as the daughters of heaven. He is said to be extremely brilliant, with radiant hair, who files in the skies like a bird and shines brightly like a jewel. Giver of power and strength, destroyer of laziness and darkness, with bright light radiating from him, he knows all that lives. Before him, the constellations pass away, like thieves, together with their beams. Swift and all beautiful , Surya is the maker of the light, who illumines the radiant realm, who goes to the hosts of Gods as well as to the world of mankind with his light. like Varuna, he is ever watchful. Because of his power and golden color, he is also depicted as provider of good health, who removes the heart disease and takes away the yellow hue (jaundice) to be given to the parrots, starlings and haritala trees. In the Vedic symbolism, Surya symbolizes Brahman. 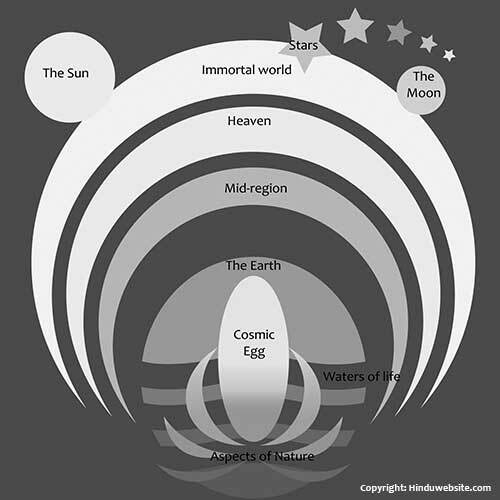 The world of the sun is frequently mentioned as the place where the immortal world of Brahman is located, which the liberated souls reach upon their departure from the earth travelling by the northern path. 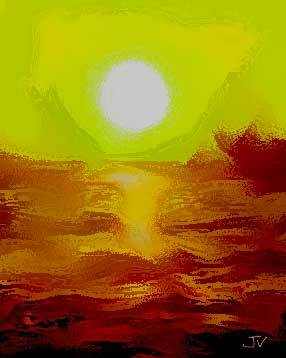 In the Vedic theology, the sun represented the highest and the best. He is eulogized as the source of prana, who keeps the world alive by brining light and vigor. The Vishnu of the Rigvedic times, is a minor god,. He is one of the Adityas, but with some qualities of the Vishnu of Bhagavatism. Like the Vishnu of later days, he is a lover and protector of devotees in whose loved mansion all god loving creatures live happily. Like the Vishnu in his incarnation as Vamana, who strode the earth and the heaven in two paces and then crushed the demon king Bali with his third pace, the Vedic Vishnu is also a god of three strides, who upholds the threefold existence, the earth, the heaven and all living creatures and in whose three wide-extended paces inhabit all living creatures. The Rigveda says that a mortal man, can behold two steps of him, who looks upon the light, but his third step no one venture to approach, not even the feathered birds of air that fly with wings. Described as the dweller of mountains and a bull with wide strides, who like a rounded wheel, sets in swift motion his ninety racing steeds together with the four, Vishnu is the ancient and the last, the primeval germ, with power supreme. Together with his spouse, he ordains and as a ruler of the three worlds, he helps the Aryan man, giving the worshipper his share of Holy Law. Savitr is an Aditya who is described as golden eyed, golden handed and golden tongued. A solar deity, he is regarded as the sun before sun rise, but sometimes distinguished from the sun. He not only represents the golden sun of the morning, but the hidden sun of dark night also. Riding a golden chariot he comes, looking on everyone. He moves both ways, upward and downward, and travels along "ancient dustless paths in the air's mid region with two bright adorable bays." From far away he comes to chases away all distress and sorrow, the rakshasas and the Yatudhanas and illumines the worlds. Mounting his golden chariot that is decked with colorful pearls and lofty with golden pole, he goes to darksome regions to illumine them. Drawing the gold-yoked car with his white footed Bays, he manifests light to all the peoples. Held in his lap all men and all beings attain immortality. The golden-handed Savitar, far-seeing, goes on his way between the earth and heaven, drives away sickness, bids the Sun approach us, and spreads the bright sky through the darksome region. Like other Adityas, he is an upholder of law and forgiver of penitent sinner. Some times he is described as superior to all the other gods, whose statutes none disobeys. "Him whose high law neither Varuna nor Indra, not Mitra, nor Aryaman, nor Rudra breaketh" The Gayatri mantra is addressed to Savitr of adorable splendor for the enlightenment of human consciousness. Savitr is the most adorable, mysterious and effulgent god of mystic realms, who is considered to be the goal, the purpose and the object of meditation. When he descends into the consciousness, a golden disc with bright pointed rays, the inner world is lit up with the splendor of God and indescribable beauty. This author has been told by experienced people that whenever and wherever the Gayatri mantra is uttered with devotion and sincerity, the whole atmosphere and the auras of the people who participate in the chanting are lit up in this splendorous manner by the golden rays that descend from above. Pusan is a pastoral god. He is the lord of the paths, who protects people from wild animals and makes their paths in solitary places pleasant to tread. He is described variously as a cloud born god, lord of the path, wonder worker, lord of all prosperity and wielder of golden sword. Pusan is the guardian of cattle who shows the way carrying a goad with a horny point to rich meadows where the grass is thick and temperature moderate. He is often associated with Soma as the whole world protectors, one from above and the other from below. Pusan stirs our thoughts, drives away the enemies, inspires the miserly to make generous donations. In some hymns he is also invoked along with Indra, his friend, whom he helps to generate ripe warm milk from the young raw cows. In some hymns he is described as the goat borne and as the god who travels across the oceans in golden ships to meet the Sun. Usha is dawn, the daughter of the sky, lady of the light, who rouses all life. She stirs all creatures that have feet, and makes the birds of air fly up. Borne on a hundred chariots, she yokes her steed before the arrival of the sun and is never late. Loved by the Asvins, sister of gods, she eludes the Sun who is always eager to catch her. She brings not just light to the sleeping mankind, but hope, happiness, riches and all the good things. Goddess of light and beauty, whom the Rsis of old time invoked for their protection and help, Usha is the gods' beloved sister, whom she brings to the earth for enjoying drops of the soma juice offered by the worshippers. . Some of the hymns speak of not one dawn but many the dawns that have gone before. The hymns addressed to Usha in the Vedas are among the most poetic and beautiful hymns found in the Vedas. The following verses illustrates this point. "She, like a dancer, puts her broidered garments on: as a cow yields her udder so she bares her breast, creating light for all the world of life..."
" The Gotamas have praised Heaven's radiant Daughter, the leader of the charm of pleasant voices." "Bending her looks on all the world, the Goddess shines, widely spreading with her bright eye westward. Waking to motion every living creature, she understands the voice of each adorer. Ancient of days, again and again born newly, decking her beauty with the self-same raiment, the Goddess wastes away the life of mortals, like a skilled hunter cutting birds in pieces." " In pride of beauty like a maid thou goest, O Goddess, to the God who longs to win thee, and smiling youthful, as thou shinest brightly, before him thou discoverest thy bosom. Fair as a bride embellished by her mother thou showest forth thy form that all may see it. Blessed art thou O Dawn. Shine yet more widely. No other Dawns have reached what thou attainest." Both night and dawn are sisters, dutiful in their movements. " Akin, immortal, following each other, changing their colors both the heavens move onward. Common, unending is the Sisters' pathway; taught by the Gods, alternately they travel. Fair-formed, of different hues and yet one-minded, Night and Dawn clash not, neither do they travel." Soma is the god of inspiration, the intoxicant who stirs the minds, lures the gods and brings them to the place of worship. One of the most popular gods of the Rigvedic hymns, the entire 9th Mandala of the scripture is dedicated to him. Also known as Indu or Soma Pavamana, he brings joy into the lives of people, cures them from diseases and leads them to the worlds of bliss and immortality. He gives strength not only to mortals, but to the gods as well. Because of him, Indra was able to slay Vrata. Because of him Agni maintains his sway. He is also known as Lord of the speech (Vachspati), because of his intoxicating influence on the movement of speech. On the physical plane Soma is some kind of intoxicating juice. It was probably extracted from some leaves, or mushrooms or some other substance by pressing them between two stones. We have completely lost the knowledge of its preparation. People have been trying for the last several centuries to know the exact ingredients with which the Vedic people used to make Soma juice, but have not succeeded so far. Even during the Vedic period the preparation of the Soma juice was probably a complicated affair. The hymns suggests that the success of extracting the soma juice depended upon the cooperation of gods, which means that its preparation was not an easy affair and depended upon several extraneous factors. Since the production of juice was central to many invocations, the god of soma was invoked to ensure that the juice flew abundantly and the ceremony would be successful. We see this concern explicit in the following hymns from the Rigveda. The Asvins are twin deities whose origin is shrouded in myth, mystery and symbolism. A number of hymns are addressed to them because of their healing and curative powers. They said descend to earth thrice a day to help the mankind with their restorative and curative powers. The Asvins are considered to be the brothers of Usha, the goddess of dawn and may actually represent twilight, when darkness and light appear intertwined on the horizon just before dawn as well as before dusk. They are praised in the hymns as wonder workers, with nimble hands and miraculous healing powers. The Rigvedic hymns describe them as lords of hundred powers, who can make the blind and lame see and walk, the injured recover quickly from their afflictions, help men produce offspring or the cows yield more milk. They can reduce the heat in the human body, cure the septic sores, store the germ of life in female creatures and perform even surgery. Traveling in a chariot with three spokes, they come down to the earth thrice a day carrying with them heavenly medicines. Maruts are powerful and destructive storm gods, who lash the world from end to end, make the mountains rock and reel, rend the forest-kings apart, make the earth tremble, and drench the earth with heavy rains. They are considered to be the progeny of Rudra, the bulls of heaven, radiant men in serried rank and free from spots and stains. But no one truly knows from where they sprang, for they only know each other's birth. Bright is their spirit and wrathful their minds. Mighty and well-armed, impetuous in their haste, decked in glittering gold ornaments, they send their windless rain even on the desert places. When they inundate the earth they spread forth darkness even in day time, with the water filled rain clouds. Loud roarers, giving strength, devourers of the foe, they make the winds and the lightning with their powers. Restless shakers, they drain the udders of the sky, and ever wandering around, fill the earth full with milk. The Maruts are positively destructive forces of the heave, ferocious but not wicked. They are divine beings, who work for the welfare of the world and men, though they do it in their quite noisy way. The Maruts give strength to the worshippers to make them invincible in battle, bring wealth to the people, increase their progeny and prolong life. The word Visvadevas means lords of the universe. In the Vedas a number of hymns are addressed to them. The Visvadevas are none but the popular gods of the Vedas. When they were collectively invoked through a common ritual, they were addressed as Visvadevas. In the hymns of the Visvadevas, we generally find the names of such popular gods as Bhaga, Daksa, Mitra, Aditi, Aryaman, Varuna, Soma, the Asvins, Saraswathi, Vayu, Prithvi, Father Heaven, Soma, Pusan, Indra, Tarksya, Maruts, Agni , Varuna, Mitra, Rta, and the dikpalas. According to some scholars hidden in the hymns of the Visvadevas are the seeds of monotheism. By addressing various gods collectively, the Vedic people acknowledged the unity of these gods and their inter relationships. The Rigvedic people believed that the devas sprang from a common parentage and were helpful in nature, in contrast to the demons who were wicked and troublesome. Although each god in the pantheon was endowed with specific qualities and responsibilities, the Vedic Aryans did not miss the larger picture and their underlying connection in the order (Rta) of things. The concept of Visvadevas changed during the post Vedic period especially with the emergence of the Puranas and its rich lore of mythology. The list was reduced to just ten gods namely Vasu, Satya, Kratu, Daksa, Kala, Dhriti, Kuru, Pururavas, and Madravas. Dhara (the earth), Anala (the fire), Apa (waters), anila (the wind), Dhruva (the pole star), soma (the moon), Prabhasa (the light) are the eight vasus who are described to be attendants of Indra, the lord of the heavens. In course of time these deities attained popularity in different areas. Dhruva became a symbol of austerity, determination and a popular name in the Hindu pantheon because of his association with the polestar. The earth became a mother deity, bearing the burden of the beings, a symbol of patience and fortitude. Soma came to be associated with soma juice and attained popularity because of his significance in the Vedic rituals. "Bright and pure as streams of water, free from all guile and falsehood, blameless, perfect," these are gods of light, with many eyes (rays) corresponding to the 12 months of the year and described as the 12 spokes of the wheel of time. The Adityas are upholders of Laws. " Upholding that which moves and that which moves not, Adityas, Gods, protectors of all beings, provident, guarding well the world of spirits, true to eternal Law, the debt-exactors," they illuminate the world, drive away darkness, nourish the beings, regulate relationships and personify the laws of the universe and mankind. "Golden and splendid, pure like streams of water, they hold aloft the three bright heavenly regions. Ne'er do they slumber, never close their eyelids, faithful, far-ruling for the righteous mortal." Originally six in the Rigveda, their number increased to 12 during the later Vedic period. The 12 Adityas are: Mitra, Varuna, Aryaman, Daksha, Bhaga, Amsa, Tvastr, Savitr, Pusan, Sakra, Vivasvat and Visnu. We have given a general description of some of the Adityas already above. Vashistha is not a god but a sage, or the head of a particular class of brahmin priests, who is described in a hymn as born to Urvasi and Varunamitra out of their conjugal love. He is also described as born from grass and as a fallen drop, whom gods in heavenly fervor laid in a lotus blossom. He is also described as the leader of the Bharatas, who brings the Saman. Indra has a great respect for him, whom he probably helped with this prayers and blessings or with his clan in the battle of ten kings. Brahmanaspati, popularly known as Brihaspathi is eulogized in the Vedas as Indra's lovely friend who gives wisdom, the healer of disease, protector of bodies, who gives wealth, increases the agricultural produce and protects the heroes in the battle field from enemy heroes. He is the priest of heaven who makes the oblation prosper. He promotes the course of sacrifice. Without Brahmanaspati, no sacrifice is complete. He is the leader of the songs and also the Law maker, whom both gods and mortals listen. He inspires the heroes with his gifts and his blessings. Addressed as the father of all sacred prayers, Brihaspati was invoked by the Vedic Aryans, through prayers and sacrifice, probably during war times, to quell the foe, slay demons, cleave the stall of kine, and find the light. He is the upholder of justice, who protects the worshippers from the evil-minded, arrogant, rapacious man and would not allow the unworthy to ascend to the heavens. The consumer of the foe, the sin's true avenger, he tames the fierce enemy and protects his worshippers from the ambush and their enemy's deadly blows. Brihaspati is also known as Ganapathi Brahmanaspati and considered by some scholars as a precursor to the latter period Ganapathi. He is also an Aditya, son of Aditi, a god of bright light. He is a giver and supporter and bestower of bliss, who discovers treasures and whose gifts are faithful. Since he grants boons, horses and heroes, he is approached by the rich and poor alike for abundance and happiness. People forgot Bhaga, but his name remains even today hidden in the name of Bhagavan. Rta is the rhythmic pattern of the universe. It is the orderly way in which the world regulates itself. Rta determines the usual paths by which the heavenly objects, the sun, the moon, the stars, the nine planets, conduct themselves. Rta is responsible for many other things: the manner in which the seasons (ritus) come and go, the way the rains fall upon the earth, the way the crops are harvested, the way the people live and die, and the cattle yield wealth through milk and progeny. The Vedic people believed this universal order to be the work of gods. They uphold Rta by virtue of their strength, unity and upholding of the Law that governs the heaven and the earth. The battle between god and demons was basically the battle between order and chaos, between light and darkness, truth and falsehood. The order prevails because of the strength and will of gods, especially the Adityas, Indra, and Agni. In course of time the concept of Rta gave way to the concept of Dharma and God as the upholder of dharma. The Rbhus are wise and skilful craftsmen, dexterous-handed, deft in work and gracious, who are said to be the sons of Sudhavan. They were generally believed to possess special powers with which they were able to make a cow out of a hide, give youth to their old parents, shape tawny steeds for Indra and make four wondrous cups out of a single chalice for gods. Rbhus bring prosperity and were probably associated with the craft of chariot making and the earlier methods of fire making. The hymns addressed to Rbhus generally mention the names of Rbhu, Vibhvan, Vaja and speak of their craftsmanship and how they were promoted to the rank of gods because of their skills and their "cunning". In the hymns addressed to heaven and earth, they are referred as two great mothers. Between them the God, the effulgent sun, travels by fixed decree. These two, the Heaven and the Earth bestow prosperity on all and sustain the region. They are holy, wise and the spirited. They keep the truth of all that stands and all that moves and were made beautiful by the sun with his garment of light. Kapinjala is a bird of good omen with sweet and flute like melodious voice whose sounds are compared to the utterances of a Sama-chanter. The invokers of this bird of heaven pray for the protection of the bird from the attacks of falcon, eagle and hunter's arrows. Associated with good luck and happy omens, there are at least two hymns in the Rigveda addressed to this mystic bird of melodious notes. 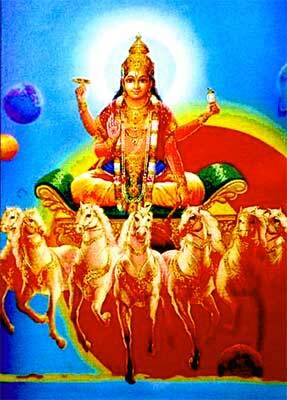 Dadhivakran is a mighty stallion that was given to Puru by gods. It is swift of foot and shines bright. It is described as the giver of many gifts, who visiteth all people, impetuous hawk, swift and of varied color, like a brave King. Some hymns in the Rigveda are entirely addressed to Dadhivakran. There is a hymn in the Rigveda addressed to sage Agastya by his wife Lopamudra as an invocation to Ratidevi to come to the aid of the aging couple and rekindle love in their bodies. Yama is the controller, god of justice and ruler of the dead and departed who go to the region of hell. Two fierce dogs, described as Sarama's offspring, with four eyes and wide nostrils, look on men and guard the pathway that leads the world of Yama. Yama is master of knowledge. He taught young Nachiketa the secrets of Brahman, fire sacrifice and immortality. 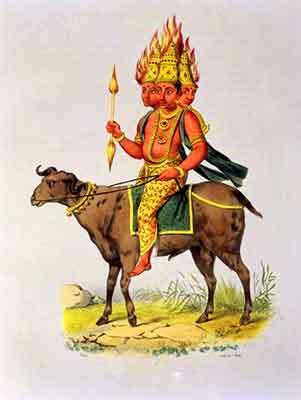 In the Hindu mythology Yama is shown as riding a he-buffalo, carrying a mace as his weapon and holding a noose. He uses the noose to drag the deceased beings to the hells. Sitting on a throne he reviews the deeds of men and accords punishment. He is aided in this task by Chitragupta who keeps an account of the deeds of the mortals when they were alive on earth. He is also the ruler of the southern quarter, wears red garments and carries a mace as his weapon. The Rigveda describes Yama as Vivasvan's Son, who gathers men together, who traveled to the lofty heights above men and who searches out and shows the path to many. Dark-hued, insatiate, with distended nostrils, Yama's two envoys said roam among the People and keep a watch. "Into the six Expanses flies the Great One in Trkadrukas. The Gayatri, the Trstup, all metres in Yama are contained." There are some hymns in the Rigveda which are addressed to Manyu a war god, wielder of thunder, slayer of foes, of Vrtra, and of Dasyu, of surpassing vigor, fierce, queller of the foe, and self-existent. He is beseeched to bring wealth and health. Manyu is a war god, who is considered to be Indra himself. Probably the Abhimanyu of the Mahabharata fame derived his name from this war hero. The famous Purusha Sukta speaks of the Universal Purusha, of a A THOUSAND heads, a thousand eyes, and a thousand feet who pervading earth from every side fills a space ten fingers wide. "This Purusha is all that yet hath been and all that is to be; the Lord of Immortality which waxes greater still by food. So mighty is his greatness; yea, greater than this is Purusa. All creatures are one-fourth of him, three-fourths eternal life in heaven." From this Purusha was born Viraj (world soul) and from Viraj again a second Purusha (hiranyagarbha) was born. As soon as he was born, the gods gathered and sacrificed him. From that great sacrifice, from his various bodily parts were born all the animals, the Riks, Sama hymns and Yajus, the sun and the moon and all the four castes, Indra, Agni, Vayu, the earth and the sky and all the regions. The Purusha Sukta is very controversial hymn. It raises a number of interesting questions, about which we can only speculate but cannot give a definite answer. One interesting question is who were the gods who gathered and sacrificed the second Purusha? Probably the original Purusha Sukta referred to the origin of the gods, the heaven and the earth, the various beings, elements, worlds and objects. It must have been conveniently altered to justify the origin of the castes and perpetuate a system that was alien to the Rigvedic Aryans. Prajanya is a rain god, ferocious, whom all life fears, the bull who lays in the plant, the seed, who smites the trees apart with lightning and slays the demons. All life fears him and the sight of his mighty weapon. He is the slayer of demons, who sends the rains down. He made the desert places fit for travel probably by bringing the rains. When Parjanya fills the sky with rain-cloud, the winds burst forth, the lightning flashes, the plants shoot up, food springs abundantly for all creatures and earth bows low before him. At his command the cattle fly in terror, the plants assume all colors and the floods descend in torrents. Not just a god of rain and thunder, Prajanya is also upholder of law who punishes the sinners and protect the people. According to S. Radhakrishnan, " Prajanya is a sky god. He seems to have become Indra, for Indra is unknown to other members of the Aryan family. In the Vedas Prajanya is another name for the sky." In the Rigvedic hymn addressed to Saraswathi, she is depicted as a river goddess, who slays the Parvathas with her might, casts down those who scorn the gods and makes poison flow away from the waters. She is the giver of opulence, strength and wealth. She has seven sisters, sprung from three fold source, who is invoked in every deed of might and sought for treasures. In the hymn addressed to her, she is beseeched to keep flowing gracefully and not to spurn people, so that they would not be forced to go to far away countries. Saraswathi subsequently became a goddess of learning and consort of Brahma. But in the Rigveda, she is a river goddess with seven sisters, who helps the gods, destroys their enemies and provides waters to the five tribes. There is no association with either Brahma or with learning. Tthe image of Sagara Manthan, Indra, Varuna, Agni, Vayu, Rudra and Surya used in this article are either in public domain or licensed under the Creative Commons Attribution-Share Alike 3.0 Unported license.